R.S. Nickerson, Engineering Psychology and Ergonomics. A. Kirlik and A.M. Bisantz, Cognition in Human-Machine Systems: Experiential and Environmental Aspects of Adaptation. S. Namba and S. Kuwano, Human Engineering for Quality of Life. G. Klein, Applied Decision Making. J.M. Flach, Beyond Error: The Language of Coordination and Stability. H. Levitt, Communication Aids for People with Hearing Loss. D.W. Massaro, M.M. Cohen, S. Daniel, and R.A. Cole, Developing and Evaluating Conversational Agents. J.A. Groeger, Expectancy and Control: Perceptual and Cognitive Aspects of the Driving Task. M.J. Dainoff, L.S. Mark, and D.L. Gardner, Scaling Problems in the Design of Work Spaces for Human Use. M. Chignell, P.A. Hancock, and H. Takeshita, Human-Computer Interaction: The Psychology of Augmented Human Behavior. C.R. Paris, E. Salas, and J.A. Cannon-Bowers, Human Performance in Multi-Operator Systems. Index. 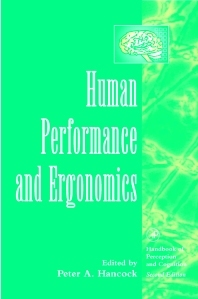 Human Performance and Ergonomics brings together a comprehensive and modern account of how the context of performance is crucial to understanding behavior. Environment provides both constraints and opportunities to individuals, such that external conditions may have reciprocal or interactive effects on behavior. The book begins with an account of research in human factors and engineering, with application of research to real world environments, methodological concerns, and rumination on current and future trends. The book proceeds to how technology has moved from being designed to help human physical survival to helping humans achieve "quality of life" improvements. Real world examples are explored in detail including hearing technology, driving, and aviation. Issues of control, maneuvering, and planning are discussed in conjunction with how intention and expectancy affect behavior. The fit between human and environment is examined as a dynamic interaction, and many chapters address the all important human-machine communication, particularly that between humans and computers. The book closes with a reminder that even our technological environment is filled with other people, with whom we must interact personally or via technology, to achieve our larger goals. Teamwork is thus discussed for its integration of cognitive, behavioral, and affective components toward our achieving desired aims.